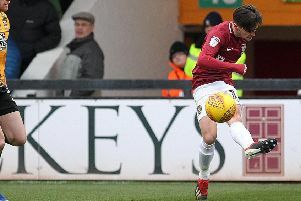 Having finally had the opportunity to get on the training pitch and assess the strengths and weaknesses of his new players, Cobblers boss Keith Curle has declared himself happy with the ‘very good’ squad he’s inherited from Dean Austin. Curle threw himself straight into the deep end on Tuesday night when he took charge of Town’s goalless draw at home to Bury despite barely knowing his new squad, holding just a couple of short meetings with them earlier the same day after his appointment the previous afternoon. Every player that played on Tuesday set a benchmark and that’s the minimum and there’s still room for improvement because I think it’s a very good changing room with some very good players. But the players were put through their paces in two sessions on Thursday as Curle took the unusual step of holding training at the PTS Academy Stadium instead of at Moulton College. “We trained at the ground because I need to familiarise myself with the surroundings to find out how the changing room area works,” explained the 54-year-old. “We trained twice on Thursday and had a staff meeting after the first session to make sure players are fit and available for selection. “The detailed planning for Swindon started in the afternoon when we had a tactical training session when we implement what we do in possession and out of possession. “There’s more to come but I was pleased with the foundation and the platform that we worked from on Tuesday and it was a good starting point. Curle also gave a positive update on the injury front with midfielder Shaun McWilliams (ankle) and long-term absentee Junior Morias (hamstring) the only doubts for the visit to 11th-placed Swindon Town, who are now under the management of Phil Brown. Curle added: “Everyone is fit and available that took part on Tuesday. There’s a few players that need some monitoring and looking after and I don’t think there will be any immediate returns for those who weren’t available on Tuesday. “There are a few long-term injuries but they’re progressing and I have a very healthy squad to choose from.